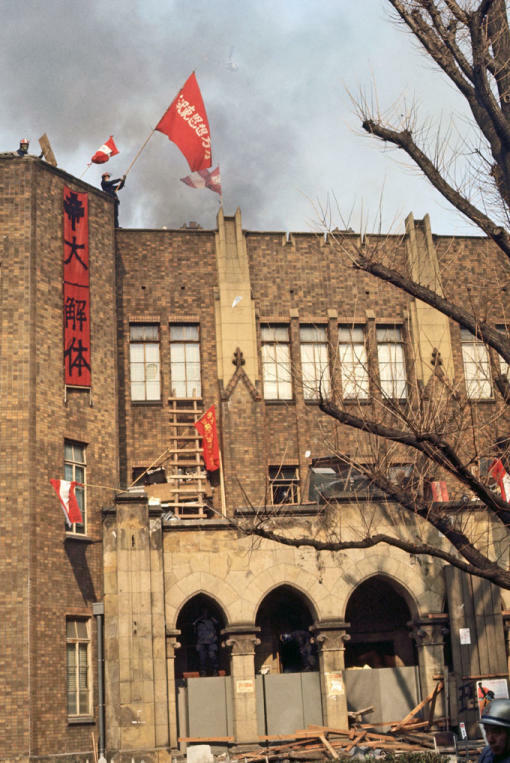 On January 18, 1969, radical students at Tokyo University took over buildings and battled police for over 11 hours. The vertical banner reads "Dismantling Tokyo University." Tokyo University was (and still is) the most prestigious university in Japan. During 1968-69, students at universities throughout Japan held various protest, including strikes and boycotts, demanding increased participation in university governance, curricular reform, and protesting against tuition increases. These protests were part of a larger wave of citizen activism in the late 1960s, especially aimed at protesting Japan's role as a staging aread for US troops on their way to Vietnam. Following the 1969 protests, it was rumored that many leaders of the student movement were blacklisted by corporations and would have increased difficulty securing employment. Sentiment turned against the students in 1970, and the strength of the student movement declined preciptiously.